The yearly event synonymous with Sydney's Italian community took place at Ottimo House (formally Castel D'oro) at Five Dock this past Saturday night (3rd August 2013). The local arts, entertainment, media and business community turned out in force. This year local creative artist, Eva Rinaldi, provided entertainment with a twist, in the form of two human statues (living statues)... one of Mary (model Victoria Gordeets) and the other St. Joseph (model Matthew Ward). 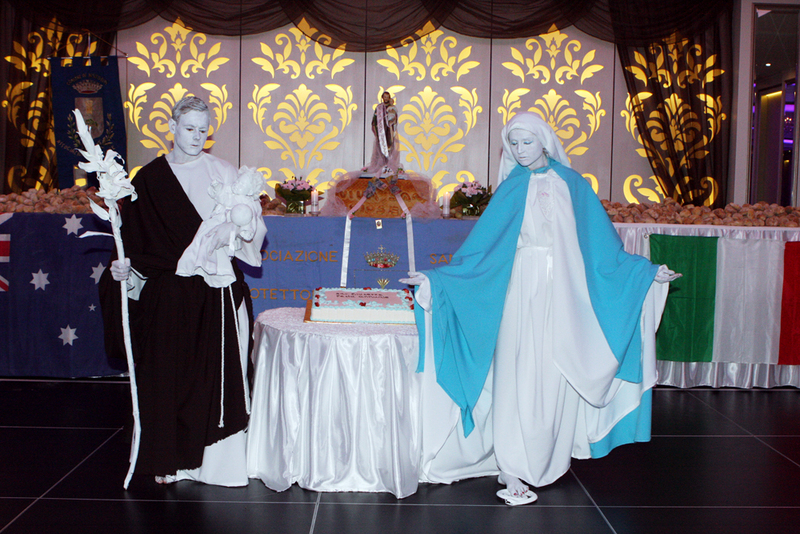 The living statues were standing side by side, with St. Joseph holding the baby Jesus in his arms. Guests were invited to have their photographs taken with the artistic bible scene themed statues, and dozens of patrons accepted the opportunity. Many of the photographs will be soon appearing in popular Sydney Italian newspaper, La Fiamma. Dinner was a beautiful five course meal, and came with a wide array of wines and beers. The event further brought the Australian - Italian community together, and also helped raise considerable funds via a charity raffle, and the funds will be channelled back into local community and charity initiatives. The day after the San Guiseppe event patrons attended the church service at St. Fiacre's, located at nearby Annandale, and they even brought along their very own San Giuseppe themed statue, which was blessed from the priest. Well done to everyone associated with the success of the San Giuseppe celebrations, and already everyone is talking about looking forward to next years event.